Our HR Practitioners are experts in auditing an organization's HR practices and make recommendations for the right services offerings based on HR best practices. Workforce planning is a teamwork involving executive leaders, HR managers and support staff from various business units. HR practitioners need to provide tools for identifying the needed competencies and for building the future workforce through strategic recruitment, training, development, and retention techniques. 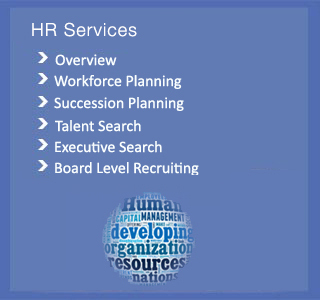 We specialize in best practices and proven tools to help HR practitioners succeed in their workforce planning initiatives. Succession Planning is an important subset of workforce planning. Its goal is the same, but its focus is specifically on having the right leadership in place at every level of the organization. Which competencies or leadership positions, the organization needs to develop for succession planning? Are leadership team aware of, and equipped to fulfill their role in developing their team for succession planning? Do they have the tools and skills to ensure their staff is developed? What applicable training is available? How will each employee’s development be monitored and measured? Which recruitment & selection strategies complement each other and afford the best opportunity to build the workforce you need? What changes to your workplace would make an organization a more desirable place to work, improving the quality of work life? Is your organization “family friendly”? How can relationships between colleagues, managers become more collaborative, positive and enriching? What promotional opportunities exist in your organization? We believe that no two executive search engagements are one and the same. 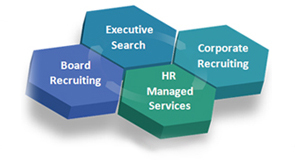 Although there are many common elements that exist between certain functional areas of expertise within a given industry, each executive search assignment must be approached and aligned to the unique business challenges a particular client is experiencing within their competitive market as well as within the dynamics of their own company. It is this philosophy that guides our approach to success. At the initiation of each executive search engagement, we invest our time and efforts as necessary to meet with members of the Selection Committee and other important constituencies to gain a complete understanding of the specific business needs and challenges facing a particular client and the business environment that the successful candidate will encounter at the conclusion of the search engagement. Such meetings provide valuable insight into the specific roles and responsibilities of a given position and the qualifications that the successful candidate must present. Equally important, these initial meetings provide valuable insight into the subtle cultural and leadership qualities that will best serve the successful candidate. At the conclusion of these meetings, we develop a unique job description document that is used during the executive search to align the right candidate for a specific leadership position within the company. One of the defining characteristics of our firm is the quality and rigor we apply to the executive search process. Finally, to help speed the time to completion for each executive search, we ask our clients to participate in periodic status meetings. These update meetings are particularly important during the search process and significantly increases the success rate. At the initiation of each Board Level Recruiting, we invest our time and efforts as necessary to meet with members of the Selection Committee and other important constituencies to gain a complete understanding of the specific business needs and challenges facing a particular client and the business environment that the successful candidate will encounter at the conclusion of the search engagement. Such meetings provide valuable insight into the specific roles and responsibilities of a given position and the qualifications that the successful candidate must present. Equally important, these initial meetings provide valuable insight into the subtle cultural and leadership qualities that will best serve the successful candidate. At the conclusion of these meetings, we develop a unique job description document that is used during the executive search to align the right candidate for a specific leadership position within the company. We provide Corporate Recruiting to source technical talent across technologies ( IBM, Microsoft, Oracle, CA , MicroStrategy to name a few ) and project management talent for our clients. Your Request Has Been Delivered Successfully. Thank You , We Will Reach You Soon.